The Division is a bleak game for the most part. There’s a nice pocket of coziness and kindness in the game, however, though it can be easy to miss. And... well, they’re watching a loop of a really short black and white movie, but I guess the base’s DVD library is limited. I’ve played dozens of hours of The Division and hadn’t known about this part of my base until today. There’s no reason to go over there, since it’s not technically part of any of the three “wings” and doesn’t have any vendors or crafting material boxes or anything. Stephen’s earlier in the game and can’t even access this part of the base, which makes me think it may be a reward for fully upgrading each wing or something like that. 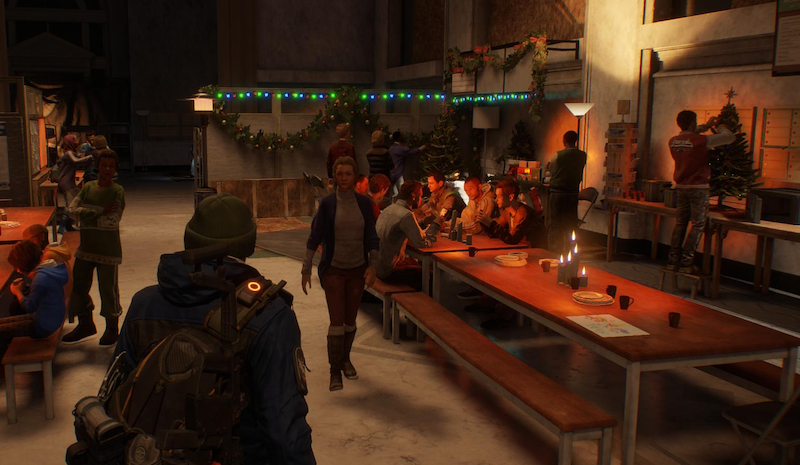 The Division’s script frequently bends over backwards to remind players that they’re working on behalf of good people and that this city and its communities are worth saving. The scene in the back corner of my base communicates that as effectively as any audio diary or spoken line of dialogue. It’s not some great revelation in environmental storytelling or anything, but it’s still a nice place to visit after a long day of shooting bad dudes on the icy streets.